... and I don't mean buying the sauce and meat at the store and assembling it at home. When we lived in Castor there was a local restaurant that sold very good donairs. However they were overpriced (in my opinion) so I looked online for a recipe. After checking out various options, I decided to combine components of several recipes to make one SUPER donair recipe. This includes a recipe for the sauce as well. Process all the ingredients in a food processor until finely ground, about 1 minute. Turn out onto a work surface and knead 3-4 times and then shape into two 11 inch rolls. Place on a greased wire rack set in a baking sheet with sides (cookie sheet). Cover the top loosely with foil leaving the bottom uncovered. Bake at 275° for 3 hours until firm and no pink inside. Let rest for 15 minutes and then slice 1/4 " slices on the diagonal, or wrap in plastic and refrigerate or freeze. Mix first 3 ingredients until sugar is dissolved. Add vinegar and continue mixing. The quicker you add the vinegar and the less you mix it, the thicker it will be. Refrigerate for 1 hour before serving. 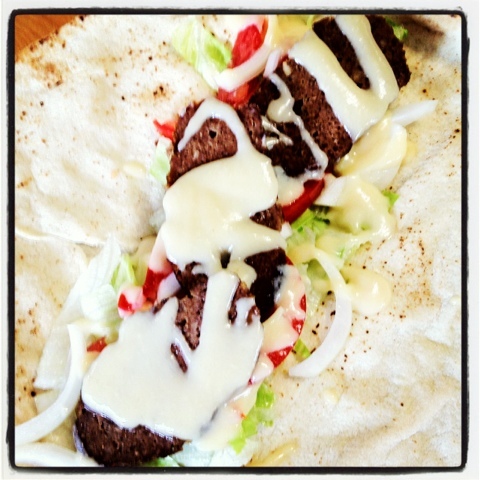 To make the donair, layer: shredded lettuce, sliced tomatoes, slivered onions, meat and sauce on a large pita.